Marine grade aluminum plate 5083 h116 has good corrosion resistance, strength and stable performance. 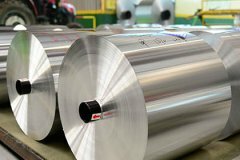 Aluminum plate 5083 h116 is an important aluminum alloy product in the fields of marine vessels, ships, yachts, offshore equipment and marine construction. Aluminum alloy 5083 has excellent corrosion resistance and weldability, coupled with high strength, this alloy is specifically designed to welding because it has a very high magnesium content, because the usability is quite limited, it can not be heat treated. The typical applications of aluminum plate 5083 are for large vessels, containers, light rails, structures and lifts. The H116 is a temper of aluminum alloy with a magnesium content of not less than 3.0%, after anti-corrosion treatment. H116 is applicable to products made of 5000 series aluminum alloy with magnesium content ≥4%. These products have specified mechanical properties and resistance to flaking corrosion. For the marine grade aluminum plate 5083 h116 is often used for ships, speedboats and other materials, there are some special certification for this product on the market, such as the CCS China Classification Society certification, DNV Norwegian Classification Society certification, etc. Only this certification approved aluminum plate can be applied to the marine industry safe without quality problem.